Lovecraft’s works still permeate modern media. In Fallout 3 there is a building called the Dunwich Building that is a nod to Lovecraft’s works and even has a DLC called, “Point Lookout,” that is inspired by the Cthulhu mythos. The Japanese Role Playing game Megami Tensai includes characters from the Cthulhu mythos. The video game Quake had a final boss named Shub-Niggurath who appears in the Cthulhu mythos first in “The Last Test” and is called, “Lord of the Wood” in his story “The Whisperer in Darkness”. The game Sherlock Holmes: The Awakened features a multiple missing persons case that is thought to be the work of a Cthulhu cult. Disney’s television show A.N.T.Farm has an episode (performANTS) that references Cthulhu heavily. Nyaruko: Crawling With Love is a Japanese light novel, manga, and anime that is based on the Cthulhu mythos. In episode 13 of Fate/Zero, Caster summons a giant sea monster by chanting Ph’nglui mglw’nafh Cthulhu R’lyeh wgah’nagl fhtagn. Digimon, House, Scooby Doo! Mystery Incorporated, South Park, Justice League, and Supernatural have all referenced the Cthulhu mythos. The insanely loved and ridiculously popular podcast Welcome to Night Vale is simply crawling with Lovecraftian themes – both in the canon and in the fanon. The first time I ever watched someone play the Halo games and I saw the Gravemind I was instantly reminded of the eldritch abominations that populate the world of the Cthulhu mythos. My friend Kristian has even written about Lovecraftian themes in video games, including the likes of Bungie’s popular Destiny, for The Artifice back in May. His stories have shaped genres, and many people have enjoyed the Lovecraftian influence in many of their favorite television shows, movies, video games, comic books, writings, etc without knowing that what they are enjoying has actually been influenced by a writer who had obvious talent, but held such hateful views and feelings. I think that it is important for the people who enjoy his writings to acknowledge the racism found within. Denying the racism is the same as being a racism apologist, and that’s not okay. If you excuse his racism with the, “he was a man of his time,” argument then you are sadly mistaken. His views were considered extreme, even for the time period. It wasn’t because of his birthplace, either. Lovecraft was a Rhode Islander. He was racist, a bigot, a believer in eugenics, etc. He had awful, awful, views. Is it okay for people to still enjoy his works? Is it okay for people to still enjoy the Cthulhu mythos and the Lovecraftian themes found in modern media, given that Lovecraft drew on his extremely problematic views? That’s a loaded question. Many people will say that they hold the work separate from the author, but I’m not sure that’s possible in the case of Lovecraft. I think it is okay love the mythos (Lovecraft was not the only author who contributed to the Cthulhu mythos). I think that Lovecraft’s work is still important from a literature standpoint because it gives readers a chance to examine and dig into something that has massively contributed to not only the horror genre, but also to the science fiction and fantasy genres. I do not think it is okay to dismiss the racism. It must be something that you are aware of at all times while you are reading his fiction. Deeply held racist beliefs aren’t things that you purge over night. It is a process. Does it excuse his past? No, not at all. It doesn’t excuse, or erase, his earlier writings. But the fact that he did start to change does help a little. Not a lot, but a little. People are allowed to become better versions of themselves, and they shouldn’t be continually punished for past mistakes. There is no proof that Lovecraft completely changed his ways, and no one should treat his writings in a way that say that he did, because that would be giving his vile views a pass. 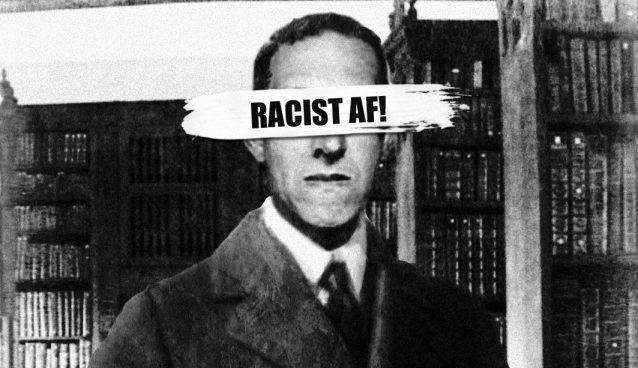 I began reading Lovecraft before I knew about his racism. Once I learned about it, and began seeing it in his writing, I was ashamed. I was ashamed that a writer I loved had these views that clashed so roughly with my own. I wanted him to be a better man than the man he turned out to be. I was repulsed by his racism and didn’t read his works, or even casually mention them, for a while. I’m not a literary scholar, but I like to understand and know things about genres, so I eventually turned back to Lovecraft to take another step into his world in order to better understand the Lovecraftian themes that permeated modern media. To this day I can get lost in one of his stories, and then find the racism, and I have to put my book down and pick another one up because I just can’t keep going. There are many fans who feel the same way. However, as I said earlier, Lovecraft’s Cthulhu mythos doesn’t live on solely because of his own work within it. There are many other writers who contributed and made it what it is today; it truly is a shared universe. Because of the diversity of the people who helped shape and mold the Lovecraftian horrors that we have grown to love, and the fact that nearly all of H.P. Lovecraft’s works are within the public domain, we have an interesting chance to make the mythos our own. We have a chance to take the best parts of the stories – the Great Old Ones, the Outer Gods, the Elder Gods, the Old Ones, their myriad of followers, the insanity and intense fear, etc – and help to create a mythos free of the racism in Lovecraft’s works. The fans of today have a chance to create their own works, for profit or just for fun, and build up on this world until we’ve made it our own – something that we don’t automatically associate with Lovecraft himself, but with the collective of writers who made it something new. We have a chance to exterminate the racism within the mythos and create horror free from xenophobia. Do you need to read Lovecraft to be able to enjoy the mythos and Lovecraftian themes? Absolutely not. Wikipedia has all of the information one would ever need in order to get a base idea of what goes on in the stories. You can even pick up a book that contributes to the mythos, or play a table top game, and get a damn good idea about it. You don’t need to be a fan of Lovecraft to enjoy the Cthulhu mythos or Lovecraftian themes because so many people have helped shaped the mythos and the themes that the fact that Lovecraft’s name is attached could be considered negligible. I believe that many people who read Lovecraft might not be actively aware of the extreme racism. Some fans of his creatures might not have even read the original source material, but became familiar with them through other means. Some readers know about the racism, but choose to not dwell on it or to overlook it. Some people actively talk about it with other readers. He’s not the only writer to have ever walked the planet with awful views, and people like him will continue to write for a very long time. But not many writers have had the impact on fiction that Lovecraft has, and that’s why he’s important to talk about – the good points and the bad – in a scholarly way. And discuss it the fans do. There are an incredible amount of articles on the internet that talk about it, and how to deal with it. S.T. Joshi is an Indian-American Lovecraft Scholar who has written about his racism on his blog (look specifically at the post on Aug. 23, 2014). According to Joshi: In the early 1930s Lovecraft wrote in a letter: “The more one thinks about India, the more one wants to vomit.” What is a plausible reaction of an Indian to this remark? Well, my first reaction was to laugh. My second reaction was to attempt to understand why Lovecraft said it. I think this highlights something that a lot of his readers often wonder – why did he think this way? Seeing since he’s dead, no one will get the chance to ask. Many people will still often wonder, and that’s not a bad thing. Wondering about it won’t give you any solid answers, but it’ll give you something to ponder as you comb through his works. I won’t tell anyone to read Lovecraft regardless of the racism. I would never do that. However, I will say that people who do enjoy his fiction should be allowed to continue to enjoy it, so long as they’re aware of the racism contained within and don’t try to excuse or polish it over. You can’t run from his racism, and you can’t deny it. You can, however, critique and ridicule it. In fact, I encourage people to critique and ridicule it.